I snagged a few books when I ordered my C.H.U.D. shirt from Exalted Funeral. 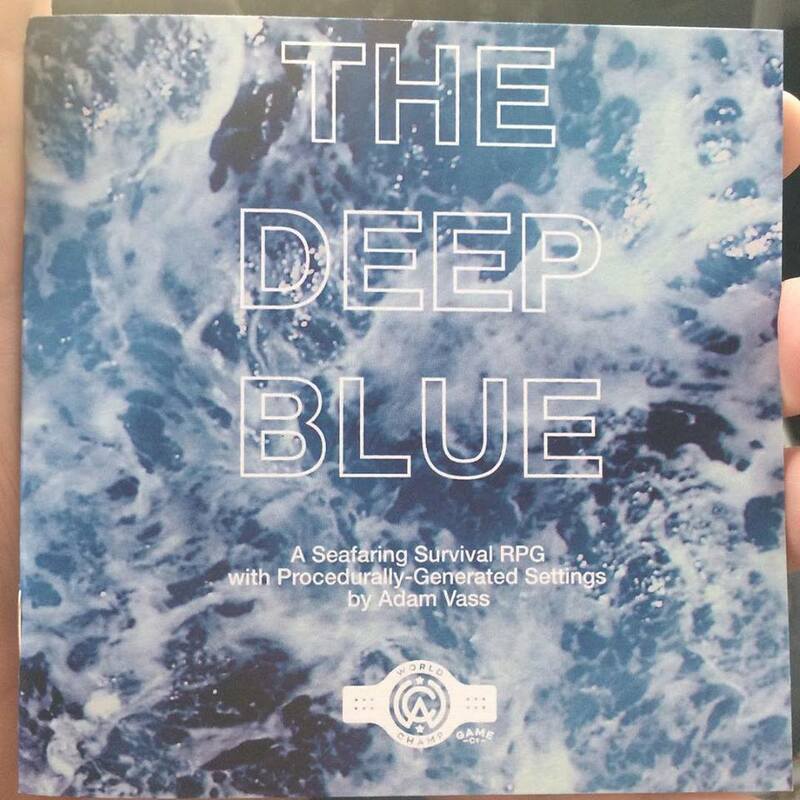 One of them was The Deep Blue. It seems like a fun and simple game (coming in at only 24 pages). It uses a Twitterbot, so there's no GM prep. Your group decides a setting and then as a group allocates 15 points to three different resources (health, livelihood, and tools). During encounters you'll wager resources, roll d6's, and track said resources (some of which are private, while others public). The goal of the game is the most simple and oldest goals... survive. Hey nerds, we got some gonzo postapocalyptic smack to lay down! 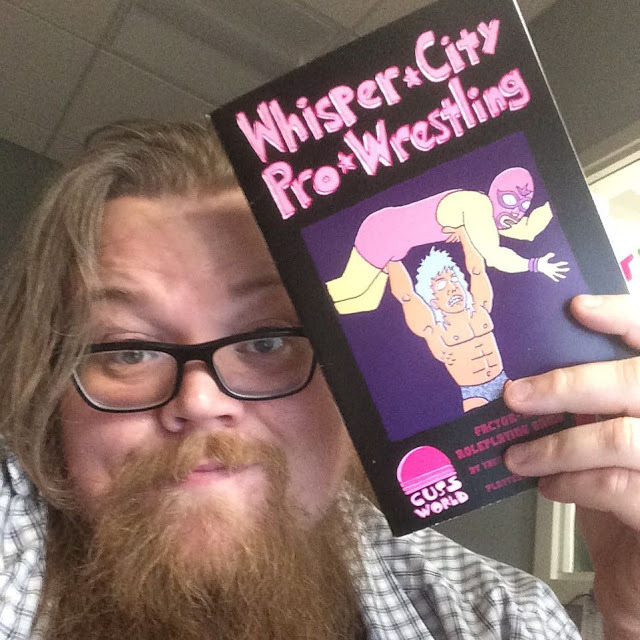 Whisper City Pro Wrestling is a post-apocalyptic wrestling game by Cuss World Books & Games. I recently ordered it from Exalted Funeral and I'm so happy I did. 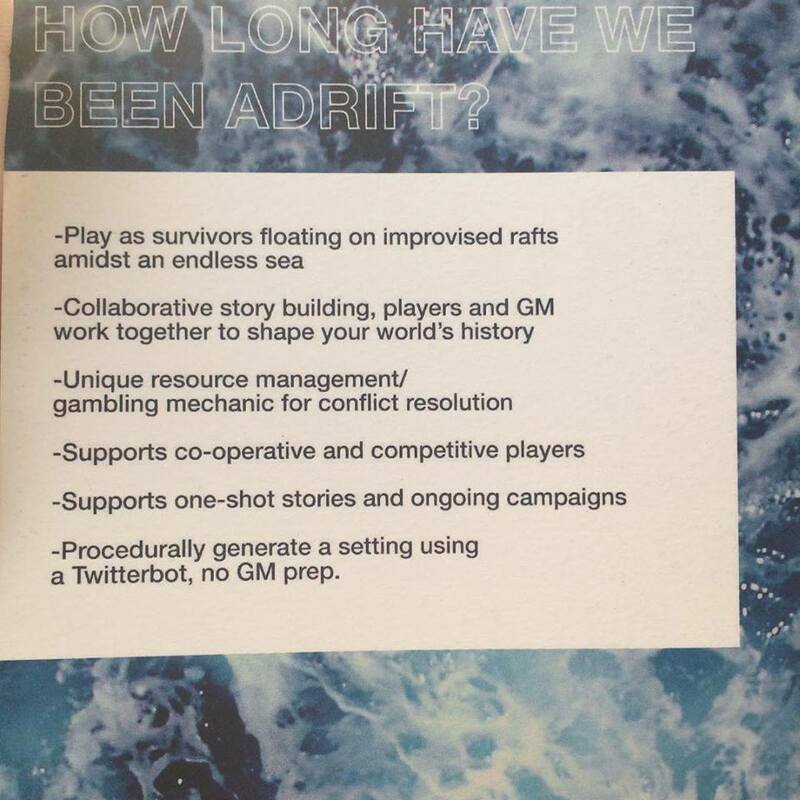 Still a playtest, The book is a less than 50 page soft cover release. The covers are in color and the interior is black and white. The book has a really quirky art style that can be seen on the cover. The art reminds me of Superjail! and is really fun. 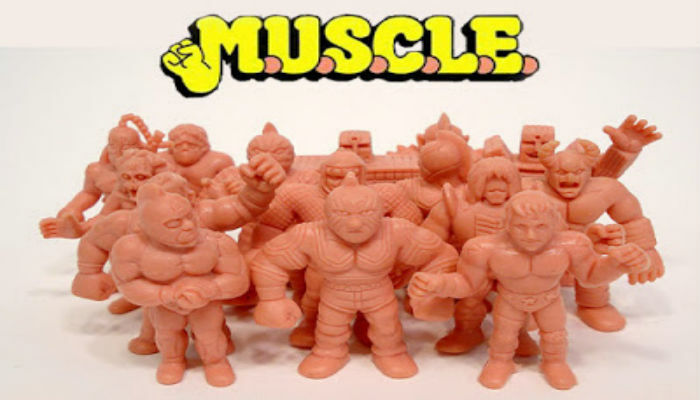 The game also share's an aesthetic with a toy line I loved as a kid, M.U.S.C.L.E. I think I might actually try to pick up some of these figures to use as minis for the game. There are actually some limited edition resin figures like this made by Cuss World. Check them out here. The setting takes place in the last bastion of civilization, Whisper City. Whisper City is a mid sized city that could be any small city that existed in the shadow of a bigger one. A great example city they author mentions is Akron, Ohio (which is also where Cuss World is based). There's not much to do in the city, except watch (or if you're character, participate) in wrestling! Because of the apocalypse and all, the borders between dimensions have weakened, which has affected things dramatically. The game uses the mighty (and underutilized) d12! This is used for everything. Character creation is random. You roll a d12 and your bio-type is determined. They are human (1-6), animal-grown up (7-9), cryptid (10), demon (11), or unfathomable (12). 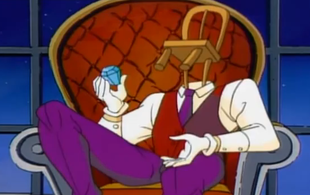 The strange of these is the unfathomable, which is basically a human body with an inanimate object head (like The Tick's Chairface Chippendale). After this you determine the type of wrestler you are. You have an equal chance of being a Muscle King (classic 80's strong wrestler), Technician (the best actual wrestlers), Showstopper (high flyer), or Brawler (street fighter). Each bio-type and wrestler type comes with its own special abilities, moves, and perks. The game includes wrestling rules (obviously), but the game isn't just about what happens in the ring. In addition to creating events, the dungeon master, will create scenarios to let their players get into all sorts of hi-jinks in the city. I've read through the book a few times and hope to run it soon. If you like odd games and/or wrasslin, you can get your copy here. 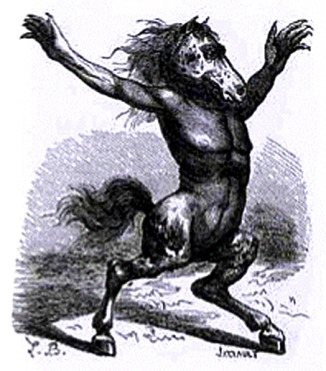 Orobos is a beautiful fiend that appears as a human/horse hybrid. While not a divine being himself, he has a connection to the divine essence tied to all gods and goddesses. He is also one of the more helpful of Hellish nobles, granting favors and acting as a mediator. Orobos is immune to all non-magical weapons. He can cast Charm Person 3/day and Charm Monster 1/day. Full disclaimer, the author had a post on Facebook asking for folks to give the game a look and I was sent my copy at no cost. Movie Night is a game for the 3D System written by Peter Fran. The storytelling game is designed to be played out in an hour or two, just like a movie. If you're looking for something longer though, you can extend adventures together to make a Season. The system is really simple. The players take part in Scenes and try to stop the Bad Thing. The simple d6 is the only die rolled and you describe what you want to do, roll a die (potentially with advantage or disadvantage) and add the associated trait. Characters in this game are kids, possibly teens, and very rarely adults. Their traits are connected to this. The book includes several premade adventure ideas based on classic movies like ET, Jaws, The Last Starfighter, Goonies, and Gremlins. There are also a few alternate settings included, which have their own special traits. These let you emulate other very 80's things like My Little Pony and Masters of the Universe. The book also includes a movie generator. The book ends with a fully fleshed out adventure that's ready to go. While I'm not always the biggest fan of storytelling games, I've fallen in love with this one. It's a very simple system, but lets you play a wide variety of things. The author designed it to get his daughter playing games and the game works perfectly if that's what you're going for. As a youth services library, I can't wait to use this with the kids and teens at my library. This is perfect for clubs and things of that nature. It's not as math heavy as some games and sessions should be less than 2 hours. 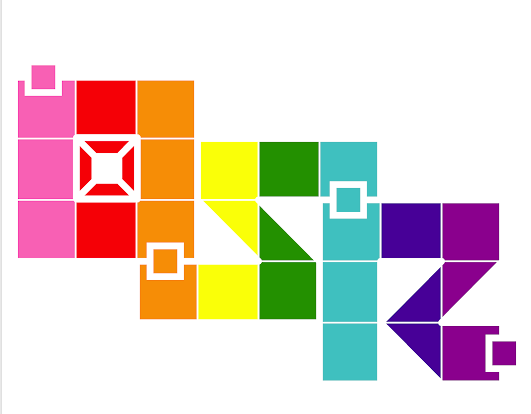 If you're trying to introduce gaming to no folks, I highly recommend this one. All versions of the game are pay what you want on DriveThruRPG. You can also grab it from Lulu. Though born into fiendish nobility, the demon known as Nybbas is considered a buffoon and charlatan among Hell's aristocracy. Despite his social status, he has a vast knowledge of dreams and their meaning. Additionally, he's tied into the skein of fate and can see glimpse of the future. Unlike many fiends, he's fond of mortals and they are his favorite play things. Nybbas is immune to all non-magical weapons. In combat he rarely engages in melee, and uses his vicious mocking to defeat opponents. He creates a biting comment directed at one target that can hear him. That target must make a saving throw or take 1d6 damage, 2d6 for a particularly nasty comment. The magic-user makes a bite comment at the expense of one target within earshot. The target makes a saving throw and takes no damage if successful. However, if the saving throw fails they take 1d6 damage. At the DM's discretion and incredibly witty or vicious insult may deal 2d6 damage. 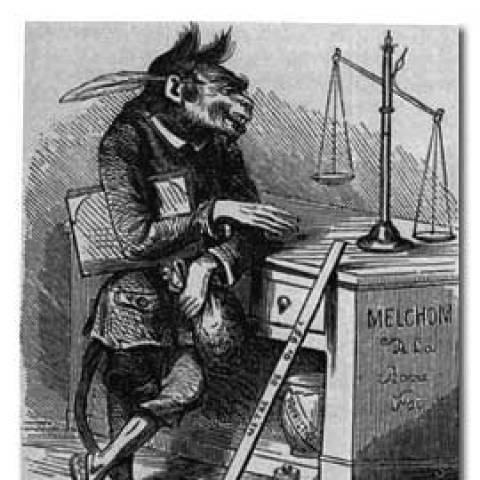 Melchom is a fiendish bureaucrat and paymaster to Hell's Legions and civil servants. 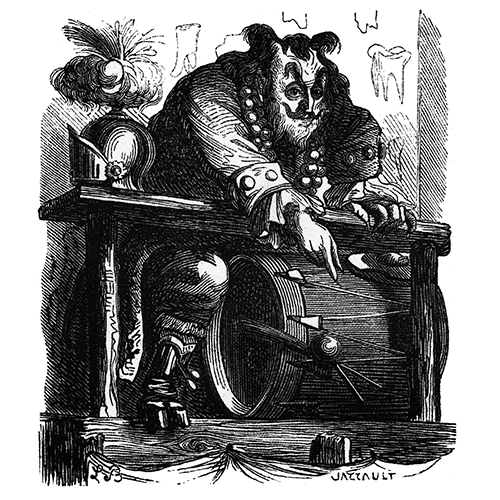 He is cruel and conniving, but follows the letter of law to a t. That doesn't mean he respects the spirit of the law, and he is an expert at finding loop holes. Occultists occasionally call upon him for his bureaucratic no-how. He is also known to give out loans, but borrowers beware of the terms. Melchom can only be injured by magical weapons. 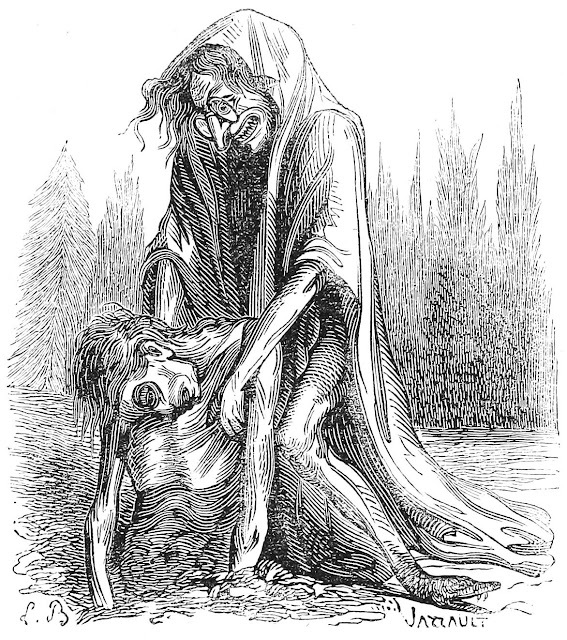 He is always accompanied by 2d4 Lemure Demons. Really? I Think The Kid Just Knows Cutting Edge Religious Comedy - She is worshipping carbonated sugar water.